Random Observation/Comment #101: As the alcohol content in these little Japanese people’s blood stream increases, so does the frequency of slurred Jap-English phrases. I had no idea what they were saying, but it was fun trying to figure it out. Even if I did understand, I waited for them to draw a picture or make funny gestures for my own entertainment. Although this was a little mean, I actually remembered the words they taught me much better when they explained it in different ways. How could I forget the creativity of their charade clues? Good times. After the paragliding adventures, we had a few hours to play some soccer and baseball. These two sports seem to be the staple of Japanese culture. Not only does everyone want to be a baseball player, but they practice tirelessly enough to succeed. From our conversations, I couldn’t tell if it was a love for the sport or a motivation to become a superstar and travel overseas to make money as a professional. I guess I didn’t expect a group of engineering students to make irrational decisions, like dropping all their work to pursue a career that has little chance of success (cough). I know happiness is important, but I guess it doesn’t buy security (::Shakes fist at Angus::). I never really played baseball, but I consider myself a well-rounded athletic person. I think basic hand-eye coordination skills and some motor functions are all you need to play quick pick up games with students that build robots. It may sound cliché, but I remember the little league kids teasing to come closer whenever I went up to bat. I felt a surge of confidence when the Japanese people all moved back when they saw I was next. I wish I could play little league now (Mitch Hedberg reference). 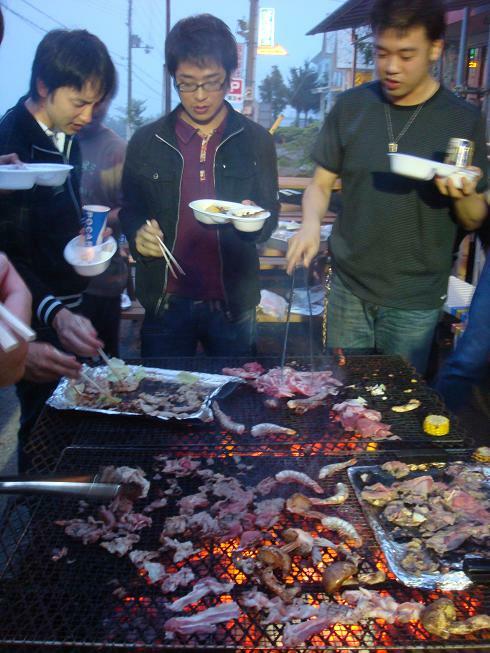 The BBQ feast we had was epic. We cooked the amount of beef equivalent to a full cow. The sizzling moo kept me stuffing my face until I truly could not move. The food coma struck me swiftly and skillfully like a trained ninja. Fortunately, the promises of sake and soju kept me from pitching a tent and calling it a night. My eyelids were heavy and my breathing slowed while I struggled to maintain a Japanese conversation. I knew it was a bad sign when I couldn’t think of anything but jumping cows and fluffy sheep. The token Irishman (hopefully not as offensive as my “little Chinaman” nickname) did not disappoint the typical stereotypes of alcoholism and drunken rage. His bottles of jager and rum proved useful for the night to follow. 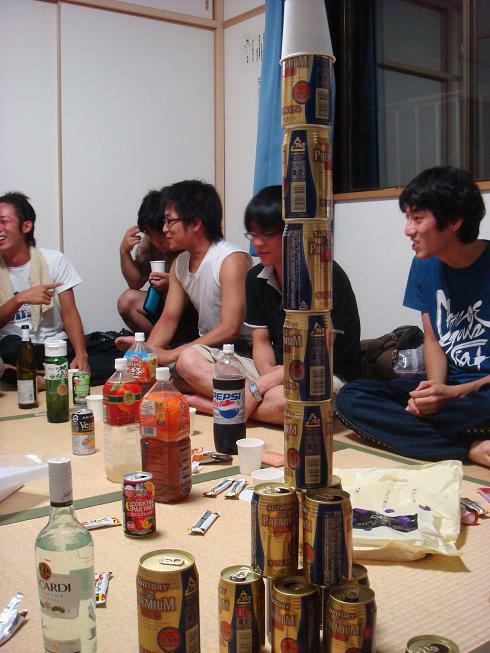 The Japanese students didn’t really need a drinking game. Most of them nursed two beers and showed their Asian glow. By the third, they were laughing for no reason and started bursting out into song. “Ponyo ponyo ponyo ponyo pon!” echoed in my ears and haunted all those that tried to escape its addictive tune. By the four, half of the group huddled in a corner, while the heavier drinkers started our drinking games. I’ve never been so drunk by 10PM (maybe zombiecon trumps it with 2PM). My memory of the night is a little patchy, but I distinctly remember wearing pink slippers outside and getting into a fight with a vending machine… He started it. So your wife let you out tonight. How much allowance did you get? No Responses to "The story of a bottle of jager and rum – it ends with their sacrifice"